I’ve done this before: thrilling with a bar that exceeds cookie-ness, thanks to all its butter. 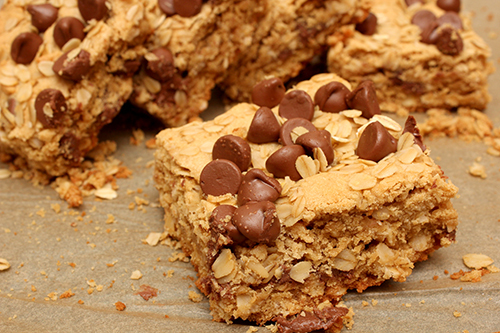 The “Oatmeal Chocolate Chip Cookie Bars,” from the September/ October 2018 issue of Bake From Scratch, are something greater than a cookie. 1. Preheat oven to 350°F. Line a metal 13x9-inch baking pan with parchment paper, letting excess extend over sides of pan. 2. In the bowl of a stand mixer fitted with the paddle attachment, beat butter and sugars at medium speed until fluffy, 3 to 4 minutes, stopping to scrape sides of bowl. Add peanut butter, beating until combined. Add eggs and vanilla, beating until combined. 3. 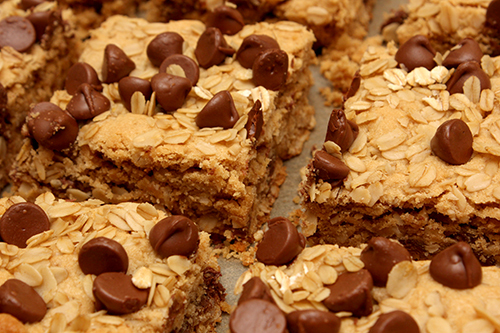 In a medium bowl, whisk together flour, 2 cups oats, salt, baking soda, and baking powder. With mixer on low speed, gradually add flour mixture to butter mixture, beating just until combined. Spread half of batter in prepared pan. Sprinkle with 1 cup chopped chocolate. Spoon remaining batter over chocolate. Sprinkle remaining ⅓ cup chocolate and remaining ¼ cup oats. 4. Bake until golden brown, 25 to 30 minutes. Let cool completely on a wire rack, about 2 hours. Using excess parchment as handles, remove from pan, and cut into bars. Store in an airtight container for up to 5 days. These bake soft, like a brownie, rather than crisp, like a cookie (thank you, butter!). I knew I would win with the dreamy flavor combo of peanut butter and chocolate and oats. I promise you, these are addictively delicious. Treat yourself. Let’s continue to bake. But next time, I’ll leave the butter behind and switch gears to autumn’s unavoidable pumpkin. Next week, I’ll make the “Pumpkin-Oat Mini Muffins,” from the September/October 2018 issue of Eating Well (but I will still indulge in chocolate chips! ).